1902, when he died at the advanced age of seventy-seven years. Our subject attended the country schools as a boy, eagerly seeking after knowledge, soon becoming sufficiently proficient in the English language to enable him to teach, which profession he followed for several years. In 1881 he went to Plainview where he had secured a position as manager for William Ragan in the grain and lumber business, and took charge of their office at Creighton, when that station was opened for business, selling the first lumber and unloading the first car of it to arrive there. The business was sold to Holbrook & Frees, our subject being retained as manager, until the following year, when in partnership with F. E. Baxter, he opened a hardware store in Plainview. Eighteen months later his father purchased Mr. Baxter's interest and changed the firm name to N. M. Nelson & Company. Several years afterwards Neil purchased his father's interest and became sole owner. He sold the hardware business in 1902 and the implement business in the fall of 1903, prior to assuming the duties of county treasurer. Mr. Nelson has been a lifelong republican. He served many years on the town board as district treasurer, and for eight years as justice of the peace, in one election receiving every vote cast except his own. In 1888 he was elected to the state convention to nominate delegates to the national convention. In 1902 he was elected to represent the nineteenth district in the state legislature, and the following years was elected county treasurer, being the first republican to succeed to the office. He was reelected the following term. He settled in Pierce in 1904, and in 1908 was elected county commissioner. In every instance he has filled the office to which he was elected, with excellent judgment, gaining the confidence and esteem of the entire country by his upright character and honest dealings. Mr. Nelson is a member of the Masonic lodge in Pierce, a prominent Knight of Pythias, Odd Fellow and Workman, and, taking it altogether, is one of the best known and most highly esteemed men of the entire state of Nebraska. Mr. Nelson was married at Plainview, December 24, 1882, to Miss Lydia A. Howell, who is a native of Peoria, Illinois, and to them have been born seven children, six of whom are now living, namely Charlotte, wife of L. C. Tonner, deputy county treasurer; Chester A., in the auto business in Pierce; Edith, wife of C. W. Ulrich, residing in Montana; Benjamin, Leonard, and Bernardine, all following honorable careers in Pierce county. The gentleman above named was for many years one of the leading citizens of Merrick county, and to his efforts were due much of the prosperity enjoyed in that region. He was a man of strong character and during his lifetime enjoyed the esteem and respect of all with whom he came in contact, and his memory is cherished by a host of warm friends throughout the country. John L. Martin, deceased, son of John and Catherine (Lutz) Martin was born in Pennsylvania, May 12, 1813, and was second in the family of eight children, all of whom are deceased. He received his schooling in the home state and later went with his parents to Ohio. While living there he was married to Miss Rebecca Casky who was born in Ireland. Seven children were born to this union: Henry, deceased, survived by a wife and several children; Impertus, died when young; Mary J., who is married to D. Callanan, lives in Laramie, Wyoming; Sarah, married to James Vieregg; Mrs. Elizabeth Turner, Grand Island, Nebraska; Charles, and John, who resides in Nebraska. Mrs. Martin died in 1872, in Nebraska. Judge Martin was one of the original forty-niners who went to seek gold in California, where he remained three years, when he returned to Ohio and engaged in blacksmithing. In 1860, our subject came to Nebraska, locating in Schuyler, where he worked at his trade two years, then coming to what was known as Platte county, later surveyed and organized as Merrick, Mr. Martin being one of the organizers. Here he homesteaded land and purchased considerable railroad land. On February 26, 1874, Mr. Martin was married to Elmira Cunningham who was born in Ontario, Canada, but at the time a resident of Polk county, Nebraska. Judge and Mrs. Martin had four children born to them: James G. Blaine Martin, who lives on the home place; Roscoe Conklin Martin, who resides in Omaha; and George Edmunds Martin, who is residing at home; and Mabel May, wife of Mert Beanblossom, who lives in Des Moines, Iowa. Judge Martin was very closely identified with all the interests of his county. He was the first teachers' examiner in the county, justice of the peace nine years, served his county as judge two terms, and also practiced law, and was instrumental in organizing school districts. He was also a surveyor and did a good deal of work in that line. He was one of the most prominent men of his locality standing for all pertaining to the upbuilding of his state and county, and was widely and favorably known. He died March 15, 1893. Mrs. Martin is still living on the old homestead, surrounded by a large circle of friends. Her father, Stephen Cunningham, died in 1888 in Polk county, Nebraska, and her mother died in 1904 in the same county. She has one brother residing in Polk county, Nebraska; one in the state of Washington; another in Ontario, Canada, and still another who resides near Kearney, Nebraska. She has a sister residing in Underwood, Iowa; one in Ontario, Canada, and another in Rolla, North Dakota. There is no more contented and happy a couple in Spencer than the venerable Martin Christensen and his good wife who are, now living, retired from all activities of busy farm life, in a cozy cottage nestling on the hillslope in the east part of Spencer. As their name would indicate, Mr. and Mrs. Christensen are natives of Denmark, his birth occurring in Langelong Island, May 9, 1842. He married in Denmark November 3, 1865, Mrs. Christensen being at the time Miss Minnie Hansen. They emigrated to America in 1871, sailing first from Copenhagen to Keil, thence by land to Hamburg, whence they crossed the North Sea to Hull. By rail they proceeded to Liverpool and from there began the real voyage to America. They landed in New York in May and came direct to Cedar Falls, Iowa, which they reached on the 24th of the month. In the vicinity of the town they rented four years, and then Mr. Christensen took the contract of feeding cattle on a large farm near by, and lived here until their coming to Nebraska in 1880. They settled on Turkey creek in Holt county, reaching their claim on the 27th of April at one o'clock in the afternoon. He pre-empted a quarter section and filed on a homestead, making a half section of fine land. In 1901 he bought an additional quarter. For twenty-nine years this industrious couple lived on their farm retiring to their present cottage home the first of September, 1909. After their marriage, Mr. and Mrs. Christensen remained in the old country as long as the parents of either lived; they having given a promise to Mother Hansen that they would remain, before she gave her consent to their union and her blessing. Of their seven children, four are living. They are: Christian, a bridge builder of Spencer; Carrie, wife of Rudolph Jeppsen; Laura, wife of Sherry Leslie; and Charlie. The three younger ones are in Gregory, South Dakota, on claims. Mr. Christensen is an independent in politics with a leaning towards the republicans. For generations their ancestors have been of the Lutheran faith. During the first years of life in the west, Mr. Christensen occupied a log house. Deer and antelope were plentiful, as many as nine being seen at one time, and wild turkeys were still to be found in the canyons. Indians were to be seen in large numbers on the reservation north of the Niobrara, and frequently crossed to the south side to trade, giving their clothes at times for chickens, or pork, and returning to camp with nothing but a blanket and breech-clout. Above his cottage in Spencer, Mr. Christensen has a fine spring which is run into reservoirs and piped into the house. Cheerful and happy, Mr. and Mrs. Christensen are found to be good neighbors and friends, a desirable acquisition to the citizenship of any town. Among the prosperous farmers of Staunton (sic) county, Nebraska, who have grown up in this locality, we may mention the name of Julius G. Wagner, owner of a most valuable estate in section one, township twenty-two, range two. Mr. Wagner was born in 1867, and enjoys the distinction of being one of the first white children born in this county. His father was a German, who came to America in the early days of western settlement, and was a pioneer successively in Wisconsin, Iowa and Nebraska. The trip from Wisconsin to Council Bluffs was made with a yoke of oxen, but the latter pilgrimage was made, by means of horses. The subscriber's mother left Prussia when she was only ten years of age. She came from a family who enjoyed some distinction as her father was a carriage-maker who worked for the king. They were married at Watertown, Wisconsin. After coming to Staunton county, Nebraska, they took up a homestead seven miles from where the town of Staunton is now situated. Their first home here was in a dugout, and it served the family as a dwelling place for several years. Having never known what life would be in one of the thickly settled and sheltered portions of the country, Mr. Wagner grew up in an atmosphere of self-reliance and endurance and hardy courage, and he has proven himself worthy of his early training. Although still in the prime of life, he may be counted among the oldest settlers of the region. He remembers many interesting details of the life of the pioneers which could not help being more interesting in retrospection than when it was endured. For a long, time their nearest neighbors in Nebraska were more than ten miles away, and Omaha was their nearest market and postoffice. In 1889, Mr. Wagner was, married to Miss Mattie Starliper. But one child has been born to them, Pehi A. Among the prosperous citizens of Antelope county who, have spent many years in this locality, is the subject of this personal review Lewis E. Shoemaker, owner of a valuable estate in Verdigris township. He is prominently known throughout the northeastern part of Nebraska as one of the foremost farmers and stockmen of that section, and after many years hard labor in building up his business is now prepared to enjoy the remaining years of his life in peace and comfort. He still personally, superintends his farm, and takes an active part in all neighborhood affairs of public welfare. part in the Indian war of 1812; he settled on the Mohawk river, near Buffalo, and afterwards became owner of land bordering that river for many miles, which was sold during the Revolutionary war to help that cause. Lewis Shoemaker made New York state his home up to 1876. He spent three years near Waterloo, Iowa, before his marriage, which occurred August 20, 1879. His wife was Miss Ada Green, of Niagara county, New York state, whose parents settled in Cedar Falls, Iowa, in the early days, and became well known pioneers of that region. Mr. and Mrs. Shoemaker's wedding tour was taken in a covered wagon across the plains toward the west, seeking a location where they hoped to make a home and fortune for themselves in the new country. The trip overland from Waterloo, Iowa, took two weeks. At one time they were intercepted by horse thieves, and had to shoot to protect their teams. Their stopping place was in section twelve, township twenty-eight, range seven, Antelope county, where Mr. Shoemaker filed on a homestead, and also took at timber claim, proving up on both tracts in the required length of time. They erected a rude frame house, and set to work to develop their farm. Their nearest market place was Niobrara, a distance of thirty miles, and all their supplies had to he hauled from there, often experiencing serious difficulty from storms, etc. In the early days Mr. Shoemaker helped to build the Fremont and Elkhorn railroad from Neligh to O'Neill. This was during the winter of the deep snows - October, 1880. They saw every phase of frontier life, but stuck to their home, and succeeded in improving it in good shape, gradually adding to the acreage until Mr. Shoemaker now owns four hundred and eighty acres of fine land, well stocked and with substantial buildings. Mr. and Mrs. Shoemaker are the parents of eight children, namely: Gertie, William, Edward, Albert, Ernest, Flora, and Rollie. They have a very pleasant home, and are highly esteemed residents of the county. They are Presbyterians in religious faith and Mr. Shoemaker is a republican in politics. Mr. Shoemaker has devoted a good deal of attention to fine stock and is the owner of "Buster Brown" one of the finest stallions in that part of the state. Levi L. Crist claims the distinction of being the first white person born within the limits of Washington county, Nebraska, and has spent most of his life in that state. He was born at DeSoto, February 12, 1858, third of the eight children born to John W. and Sarah (Hull) Crist. He has one brother, George B., who lives in Custer county. When sixteen years of age he went to Iowa and spent a couple of years there, then returned to the old home in Nebraska, and in 1882, secured a homestead on one hundred and sixty acres of land on section twenty-seven, township sixteen, range seventeen, where he lived several years. On March 24, 1883, Mr. Crist married Eunice M. Highly, who was born in Nebraska, a daughter of G. W. and Mahala Highley, and in 1894 moved to Missouri. After spending about four and one-half years in that state Mr. Crist removed to Arkansas, then leaving Arkansas on account of poor health, landed at Topeka, Kansas, Mrs. Crist died January 28, 1900, at Topeka, Kansas, being survived by her husband and the following six children: Alva, married, has two children and living in Colorado; Arta, wife of Bert Sell, of Colorado, has four children; Etta, wife of Hershel Sherbeck, of Custer county, has one child; George Milton, married Mae Burdick, and living in Custer county; Elsie and Elver Lester, at home. In the fall of 1901, Mr. Crist returned to Custer county and has settled on section sixteen, township seventeen, range thirteen, a part of his father's timber claim. He is a patriotic son of Nebraska and always took a commendable interest in everything pertaining to the welfare of his county and state. In political matters Mr. Crist is a socialist. He is a member of the Deciples of Christ, and has always been recognized as a reliable, substantial citizen. During his long residence in Nebraska he made many friends For some years having been troubled with asthma Mr. Crist in 1911 decided on going west for his health, so on Thursday, October 12, 1911, with his bible in his pocket and a white ribbon on his coat he left the loved home, and people and state, and started for Colorado in a covered wagon, driving four good horses. He took with him Elver Lester, his son, leaving his daughter, Elsie Highly Crist, with Etta Sherebeck, his sister, for the present, expecting her to join them in Colorado in the near future. His present address is Carey, Colorado. Harry H. Bailey was born in northeastern New York, August 12, 1854, and was third of four children in the family of Daniel C. and Susan Alzina (Dale) Bailey, who has three sons and one daughter. Daniel Bailey, the father, was born in Canada, just across the line from the United States, while his wife was a native of Vermont. Daniel Bailey and family moved from New York state to Wisconsin in 1855 or 1856, going on a farm in Waupaca county, where they remained fifteen years. While a resident of this state the father, in 1864, went into the army, serving nine months in the campaign around Richmond, and after the close of the war returned to Wisconsin. settling in Valley county, and Mr. Bailey took up his homestead on the southeast quarter of section ten, township nineteen, range fourteen, in September of 1872, and this remained the home of the father until the time of his death, May 10, 1907. He was a pioneer of Valley county who has the respect and esteem of many friends. His wife, Susan Alzina Bailey, passed away on the old home farm on October 26, 1908. Their son, George B. Bailey, died May 31, 1907. The Bailey family were of the few that remained on their old homestead farm, and they always took an active part in the development of Valley county along all lines until the time of their death. Mr. Bailey was in his eighty-seventh year and Mrs. Bailey in her eighty-sixth at the time of death. A more extended sketch of the Bailey family will be found on another page of this review. Harry H. Bailey, the principal subject of this sketch, now owns the old farm, and Valley county has been his home since 1872. On August 20, 1896, Mr. Bailey was united in marriage to Miss Mary Johnson, a native of Wisconsin, at the home of her parents, John A. and Helen (Gunderson) Johnson, in Dakota county, Nebraska. Mr. Johnson and family first came into Nebraska in 1867, settling in Dakota county four miles west of Homer, which remained their residing place until they went to California to live in 1904. Mr. Johnson was a veteran of the civil war, and a pioneer of Nebraska. Mr. and Mrs. Harry H. Bailey are the parents of two sons: Louis Dale and Frank E. They have given a good home to two orphan girls, Ethel and Lillie Harcourt, rearing them as tenderly as if they were kindred. Mr. Bailey has served on the county board as a supervisor from Ord township, while Mrs. Bailey is a member of her school district board. Mr. and Mrs. Bailey and family are active along all lines toward the advancement of their home state and county, and have had much to do in various ways with the growth and development of Valley county; they are earnest workers along educational and church lines. The family are members of the Methodist Episcopal church, and Mr. Bailey is a member of the Modern Woodmen of America, and is a republican in politics. Mr. Bailey, in addition to his land in Valley county, has a half section of farm land in Garfield county. He is a successful man, and one of the best known in Valley county. A view of his residence, together with a reproduction of the old log residence in which so much of the public business was transacted in an early day, and scenes on the farm, are to be found adorning one of our illustrative pages. 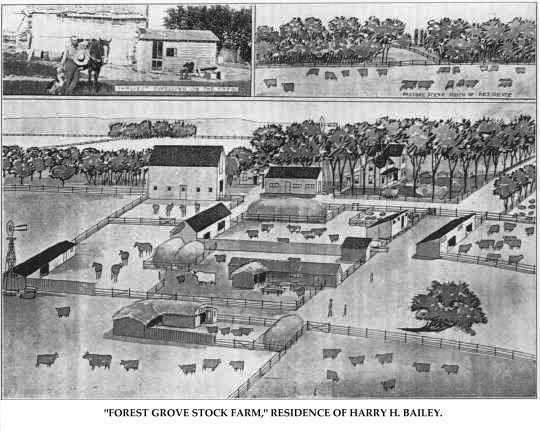 "Forest Grove Stock Farm," Residence of Harry H. Bailey. Earliest Dwelling on the Farm. Chris Henzler, who was one of the well-known old-timers and pioneer business men of Pierce, Nebraska, at the time of his death in 1910, enjoyed a pleasant home and a host of warm friends gained through strict integrity and honesty during many years of faithful performance of duty. Mr. Henzler was born in the village of Reitwaugen, province of Wittenberg, Germany, on May 9, 1840. His father died about 1853, and him mother several years later. In the fall of 1857, our subject left Bremen in a small sailing vessel for America. After forty-four days of sailing and drifting about, they landed in New York, and he went up the river to Albany. There he learned the carpenters trade and worked there up to 1863. He was married there, and in 1863 came with his young wife to Wisconsin. They lived in Dodge county for ten years, Mr. Henzler following carpentering during the summer and felling timber and cutting wood through the winters. They next moved to Davenport and he worked at his trade until he was sent out by the owners of the Farley ranch in Pierce county, Nebraska, to erect the buildings on the place. He landed in Pierce, Nebraska, in May, 1881, at a time when there were but three or four houses in that town, and after completing his first job, took the contract for the building on the Gilman ranch, which he executed to the satisfaction of his employers, and from that time he followed his trade continuously, erecting many farm houses, barns and bridges, and later turned his attention to larger contracts in town. He erected many of the finest buildings in Pierce, including the new school house, the court house, and a number of the business blocks, and owned quite a number of fine dwellings. In 1905 he retired from active business, and at the time of his death, occupied, with his family, a comfortable home in the suburbs on which is a goodly amount of fine timber, all of which was set out by his own hands. Mr. Henzler's marriage occurred in Albany, New York, on October 10, 1861, his bride being, Annie Senbel, a native of Bavaria, who settled in New York state with an uncle several years previously. Mrs. Henzler also died in 1910. Mr. and Mrs. Henzler had eleven children, ten of whom are living, as follows: Kate, Michael, John, David, Chris, junior, Annie, Lizzie, George, Gertude and Ida, all well settled in life. Mr. Henzler was a republican, and a worthy citizen, and himself and wife were active members of the Evangelical church. William H. C. Chinn, now retired, was for many years one of the leading business men, and prominently known pioneers of Howard county, Nebraska. He is a man of large interests financially, who, with his estimable wife, enjoys a large acquaintance and is held in the highest esteem by all. The family now occupies a handsome residence in St. Paul. ana, born November 4, 1830, and is the fourth member in Chichester and Lucy Chinn's family of nine children. Mr. Chinn received his education in his home county, and spent his boyhood on the home farm. At the age of seventeen his father died, leaving the responsibility of the farm on William, and from that time on he gave his entire time to those duties, remaining there up to 1855, at which time he removed to Henry county, Illinois. He settled on a farm with his family, and carried that on for ten years, then returned to Rochester, Indiana. There he was engaged in the mercantile and lumber business to 1882, and in the spring of the latter year brought his wife and three children to Nebraska, locating in St. Paul. He had two sons who had previously located in Howard county, and it was through their accounts of the possibilities of the state that their father had decided to locate here. Mr. Chinn and his second son, Chichester, at first engaged in the drug business in St. Paul, and ran the store for about nine years. They built up a large patronage during that time and prospered, from time to time purchasing farm lands in the vicinity, and in time Mr. Chinn became proprietor of a whole section of fine land which he improved in good shape, now being a very valuable property. On May 9, 1854, Mr. Chinn was united in marriage to Nancy Timander McCown, of Preble county, Ohio, the ceremony taking place in Rochester, Indiana. They have had six children, as follows: Edward F., married, father of four children, residing in St. Paul; Chichester, now a widower with one child, living in Ord, Nebraska; William Albert, and Lucy A., both now deceased, the latter having married William Pruyn; Grant, living at home and Mary, wife of Dr. F. S. Nicholson, mother of two children, they also are living in St. Paul. Mr. and Mrs. Chinn and family are among the prominent members of society in St. Paul, and their home is one of the pleasant and hospitable domiciles in the locality. In March, 1909, our subject, with his wife, left for a trip through the western states, and spent three months touring the beautiful state of California. Mr. Chinn is at republican politically, has always taken an active part in the affairs of his county and state, and is a staunch supporter of his party. In 1900 he was elected county commissioner and held the office for one year. Francis M. Cushing, born in Ulysses, Potter county, Pennsylvania, December 7, 1847, was ninth of ten children in the family of Leavitt and Jane (Goodrich) Cushing. The Cushing family goes back in history to England, and the family have in their possession data and material placed in historical writings and published in book form for the gratification of the family at large. This history goes back in detail to 1327, and the original coat of arms of Roger Cossyn, William Cusseyn and others was undoubtedly "Gules an eagle displayed Argent." The Cushing family dates back in American history to Matthew Cushing, who came from Norfolk county, England, in 1638, sailing for Boston in the ship "Dilligent." The family from that date until the present time has been it, prominent family in American history. Mr. Cushing, subject of this biographical writing grew up in Pennsylvania and was a farm boy of Potter county, Pennsylvania, the father being one of the original settlers of that county. Francis M. Cushing, in company with T. N. Bennett and others, came to Nebraska in 1872, having left Pennsylvania the eighteenth of March. Mr. Cushing stopped in Howard county, remaining until July, 1872, when he came on up into Valley county, taking up a pre-emption claim in the southwest quarter of section fourteen, township nineteen, range fourteen. Mr. Cushing proved up on his land in 1873, and in 1876 went to the Black Hills; in 1881 he made a visit to his old home in Potter county, Pennsylvania, returning again in the fall of 1883 for the girl of his heart, and on December 13 was married in Potter county to Miss Kate A. Bassett, at the home of her parents, Orren R. and Zeruah (Lewis) Bassett. Remaining in the Keystone state until June, 1884, Mr. and Mrs. Cushing came to Ord and built a town residence. During the years intervening between 1872 and 1884, Mr. Cushing retained the ownership of his original pre-emption farm; after employment for a number of years in Ord as carpenter and bridge builder, during this time being engaged in the bridge department of the Northwestern railroad, erecting all the bridges between Plum creek, in Brown county, and Valentine. Mr. Cushing erected a comfortable dwelling on the farm in 1903, which is now his residence. Mr. and Mrs. Cushing have three children, named as follows: Frank Leavitt, Marion J., and Herbert Louis, all of whom are residing at home.. Mr. and Mrs. Cushing and family have had much to do with the upbuilding of Valley county, and are widely and favorably known along social and educational lines. Mr. Cushing, whilst not active along political lines, is independent in politics, and has always done his part toward the uplifting of his home county and state. The family are members of the Baptist church. Mr. Cushing has weathered several of the worst Nebraska blizzards since he came to the west, and has seen the country devastated by grasshoppers, hail and drouth. Mr. Cushing is fond of hunting and came to Loup Valley before the antelope, deer and elk had been driven from the plains. DOCTOR WILLIAM H. H. HAGEY. men of his section. He is a native of Pennsylvania, being born in Trappe, in that state, December 5, 1841, and was the sixth in a family of nine children, all of whom are deceased but one sister, who resides in Fort Collins, Colorado, and our subject. Our subject is the son of George and Sarah (Moyer) Hagey, both of whom are deceased, the father died November 3, 1887, and the mother in 1849. In 1855, when Doctor Hagey was fourteen years of age, he went with his father and the rest of the family to Sterling, Illinois, where his father engaged in clock and watchmaking, and where our subject received his education. On May 24, 1861, Mr. Hagey enlisted in Company B, Thirteenth Illinois Infantry, serving thirteen months, and was discharged on account of illness. In the spring of 1864, he re-enlisted for one hundred days in Company A, One Hundred and Fortieth Illinois Infantry, and received his discharge in October, 1864. After the war, Mr. Hagey returned to Illinois and studied medicine about one year, and in 1865 entered Rush Medical College in Chicago, graduating in the spring of 1868. He then established a practice in Coleta, Illinois, where he remained until 1872, and after a few years practice in Chicago and Sterling, Illinois, came to Norfolk, Nebraska, in June, 1888, where he has through these years continued to practice his profession. Since June, 1890, Doctor Hagey has been secretary of the Norfolk Pension Examining Board; for several years has served as treasurer of the Elkhorn Valley Medical society, in the years of 1908 and 1909 serving as its president. On October 1, 1873, William H. H. Hagey was married to Mrs. Emily Humphrey McKibbon, of Lewis county, New York state, who had for some years been a teacher in the public schools of Illinois. Mr. and Mrs. Hagey have had three children, whose names are as follows:. Emma Joanna, city librarian of the Cedar Rapids, Iowa, library, Charlie H., who lives in Los Angeles, California and Alice M., who died in infancy. Doctor and Mrs. Hagey are among the earlier people of Nebraska, and are widely and favorably known. Mr. Hagey is a member of the Masonic order, the Modern Woodmen and the State Medical Association, and is a republican. Richard E. Brega has for long been a prominent factor in the farm, ranch, business and financial life of Custer county. He is one of the county's earliest settlers and belongs to a family that has been active in many circles. He was born in Brampton Canada, October 1, 1861, next to the eldest of the six children of Frank B. and Charlotte E. (Birdsall) Brega, the father a native of Jamestown, Virginia, and the mother of Canada, where they were married. The father of Frank B. Brega, was one of two hundred and seventy exiles who were sent out of Spain for political offenses, and was a member of the nobility. The parents moved to Detroit when Richard E. Brega was about twelve years of age and he there completed his education. About 1876 the family moved to Fairbury, Illinois, and a year or two later to Custer county. There were the father and mother and six children, and they took claims of homesteads, pre-emptions and timber claims to the number of sixteen, all in Custer county. The father became prominent in business circles and was active in the political life of Custer county and Nebraska, being one of the best known men in the region. He was a speaker of rare ability and power and often made speeches and addresses in other states. His death occurred while making a political speech at a banquet in New Mexico, whither he had gone for his health, in 1883. His widow died in Callaway, Nebraska, in 1901. Mr. Brega took up the study of law in Omaha in 1888, being admitted to practice two years later, and has held a continuous residence in Callaway since, that place having been his home the past twenty-two years. He was engaged in the banking business there for a time in past years and is now engaged in the practice of his profession and conducts a real estate and loan business. He is himself a large land owner, owning some five thousand acres in the county. He raises a large amount of alfalfa with good profit. In politics he is a democrat and active in party work although not an office seeker. He has for several years past been a strong advocate of the dividing of Custer county and making Callaway the new county seat. He is well known for his ability along professional business and political lines and he and his family are prominent in social and educational circles. They have a beautiful home in Callaway where they have a large number of friends. He is well known throughout central Nebraska where so large a part of his life has been spent and is one of the most successful men of the region. On December 7, 1884, Mr. Brega was united in marriage with Milly Varney, a member of one of Custer county's early families and five children have blessed their union: Emily, married Ray B. Bennett, cashier of the Bladen (Nebraska.) State Bank, a son of Doctor Bennett, of Kearney, and they have two children; Everett B., Irene, Valiar and Richard E., junior, at home. Mr. Brega had brothers and sisters as follows: Frank died in Omaha in 1886; Charles, died in Kansas City in 1910; Charlotte, Mrs. F. S. Dolph, of McLouth, Kansas; Fannie, an actress of New York, a member of the John Drew company, has the stage name of Hope Latham, and William Penn, of Kingsville, Missouri. James G. McClure is one of the largest land owners of northeastern Nebraska, where the family have lived since he was a boy. He is one of the best known men in his part of the state and is prominently identified with the best interests and advancement of the region. Mr. McClure was born in Illinois in 1872, a son of Hay and Fanny C. McClure, both natives of the Keystone state. The father, a farmer by occupation, served in the civil war from 1862 until 1865, and then returned to his home in Illinois. In early boyhood James G. McClure received an excellent education, and as a child he accompanied his father to Nebraska, where the latter purchased his present farm in Cedar county. The father returned to Illinois and in 1879 brought his family to North Platte and thence to Grand Island, Holt county. He took up a homestead, tree claim and pre-emption claim and improved same. The family went to Neligh, thence to O'Neill and later to Sioux City. When they first came to Nebraska, deer and antelope were frequently seen in Holt county. They passed through the usual difficulties and hardships of pioneers and triumphed over many discouragements. Mr. McClure has lived on his present farm, on section twenty-one, township twenty-nine, range one, west, since about 1894, and has brought it to a high state of cultivation. He operates twelve hundred acres of land, whch [sic] he devotes to general farming and stock raising, making a specialty of Hereford cattle and Percheron horses, and his Missouri jacks have a wide country wide reputation. In 1903 he was married to Miss Mary Langeman. Herman G Mithofer a well-known farmer and citizen of Merrick county, Nebraska, resides on section eight, township fourteen, range seven, where he owns a well equipped farm and carries on general farming and stock raising. Mr. Mithofer was born in Germany, October 26, 1859, and was the second of three children in the family of Frederick William and Catherina Mithofer, who had two sons and one daughter. Mr. Mithofer was raised on a farm, and in 1880 emgrated [sic] to America, locating in southern Indiana for several years and in Illinois for seven years, then coming from Illinois to Merrick county, Nebraska, following his occupation of farming all through these years. On March 2, 1889, Mr. Mithofer was married to Miss Augusta Holtz in Menard county, Illinois. Miss Holtz was also a native of Germany, coming to America with her parents in 1881. Mr. and Mithofer have had five children born to them, whose names are its follows: Adeline, wife of Charles Tuttle, lives at Palmer, Nebraska; and Emma, Frederick, Minnie and John, all of whom reside at home. Mr. and Mrs. Mithofer came to Merrick county in March, 1889, and now reside on their farm two miles north of Archer where they have a pleasant home and a finely equipped place. Mr. Mithofer's parents and brother, William, came to Indiana from Germany in 1881, coming to Merrick county in 1893, where the parents lived until the time of their death, the father's death occurring in 1907, and the mother passing away in 1908 at advanced ages. Our subject's brother, William, resides south of Archer in Merrick county. Mr. Mithofer has always taken an active interest in local affairs, and for years was a member of his school board in district number forty-three. He also served on the County board from his twonship [sic], from 1902 to 1906. He is a highly respected member of his community, and enjoys the confidence and esteem of all who know him. Of the prominent and leading citizens of Knox county, Nebraska, none are held in higher esteem by their fellow citizens than Charles E. Kellogg, proprietor of one of the most valuable estates in the county, and who resides in section eight township thirty-two, range seven, where he and his family enjoy the respect and good will of a host of friends and acquaintances. He is prominently known throughout Knox county as one of the foremost farmers and stockmen. He and his father before him, have been potent factors in the development and growth of eastern Nebraska. Mr. Kellogg is a man of untiring energy and sterling characteristics and bids fair to emulate his father's excellent example of perseverance and success. Mr. Kellogg is a native born Nebraskan his birth occurring in Saunders county in the year 1875. He is a son of Henry and Zella (Koon) Kellogg. The father is a native of New York, and the mother of Michigan, being of Irish descent. The father came to Saunders County, Nebraska, in 1874, remaining there until 1881, when he removed to Wayne county, our subject at this time being seven years of age. In Wayne county he grew to his manhood years, and in 1898 was married. Mr. Kellogg came to Knox county, Nebraska, in 1902, and bought the farm which is known as the Borton homestead. He now owns two hundred and eighty acres of fine improved land, and has two acres of trees. Mr. Kellogg was united in marriage in 1898 to Miss Sadie Whaley, and Mr. and Mrs. Kellogg are the parents of four children, named as follows: Henry, Marvin, Blanche and Letha.